In a trading chart, a continuation pattern tells you that buying or selling pressure is pausing. If a big-picture trend is well established in the trades you’re charting, the pattern suggests it will accelerate after the pause. A continuation pattern, therefore, is a good place to add more to a position because you expect an additional move in the same direction. Continuation patterns tend to be fairly short term, sometimes only a few days, and are often neglected as a consequence. Ascending triangle: The price isn’t making new highs, and the topmost (resistance) line is horizontal. You may worry that the failure to make new highs means that the up move is over. But the price isn’t making new lows, either. You can often expect a breakout of the top line to the upside. When you can draw a horizontal line along a series of highs, remember to look for a rising line along the lows at the same time. Not only does the ascending line of lows confirm the trend continuation, but it also provides you with a ready-made stop-loss level at this ascending support line. 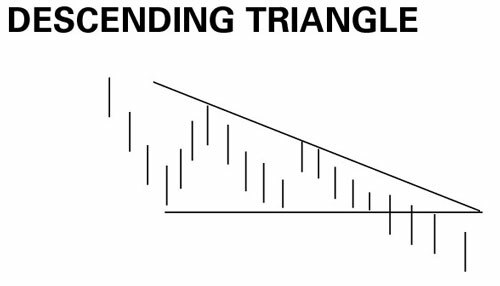 Descending triangle: The mirror image of the ascending triangle. The price is failing to make new lows in the prevailing downtrend. You wonder if the trend is failing. But if you can still draw a line along the series of lower highs, it would be a mistake to buy at this point — the probability is high that the downtrend is going to continue. A dead-cat bounce is a peculiar continuation pattern that looks like a reversal at the beginning, with a sizeable upward retracement of a down move, but then fades back to the same downward direction. 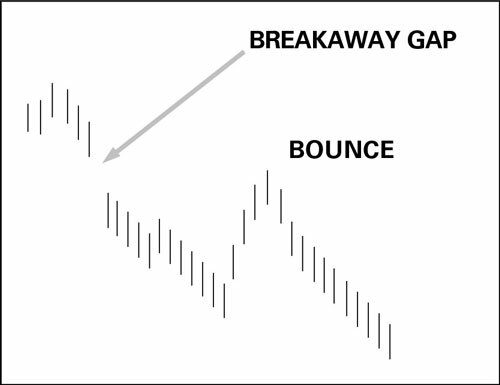 A dead-cat bounce occurs only in down moves and no equivalent named pattern exists for a parallel sequence of events in an up move. It starts off with a negative fundamental event that triggers a massive down move. The bounce is an upward retracement that may make you think the drop is over. The pattern includes a breakaway downside gap about 80 percent of the time, and sometimes the bounce upward fills part of the gap. Many traders mistakenly think that if a gap is filled, even partly, the preceding move has ended. The dead-cat bounce is one of the patterns that disproves that idea.